Bullying is rife in academia – and it is tolerated to an extent that wouldn’t be acceptable in other areas. I’ve seen careers wasted in academia just by bad management and bad practice. My story is an illustration of what can go wrong. The story intertwines the writer’s difficult personal circumstances and bullying at work, a not-uncommon combination, and it shows the deeper contexts in which these behaviors arise. For those interested, The Guardian also is sponsoring an anonymous survey on bullying in higher ed that can be accessed from the article, the results of which will be used in the newspaper’s research study on the topic. This is one of many accounts I’ve heard over the years about bullying of teachers at the K-12 levels. It’s a terribly serious problem, and the most horrific stories are like something out of a dystopian novel. Especially in the work context, the definition of gossip can be hard to corral. The online Merriam-Webster dictionary defines gossip as “information about the behavior and personal lives of other people.” In the workplace, however, these shared tidbits can also include details and rumors about salaries, working relationships, and working conditions. In many instances, this is the stuff of everyday conversations at work. However, the presence of frequent and intense workplace gossip may signal deeper dysfunctions about an organization’s culture. It may manifest itself in offsite social media exchanges. In more severe instances, what might appear to be casual gossip is really part of a targeted campaign of defamation or bullying. Office gossip can be a welcome distraction. It just can be hard to know what to do when you become the focal point. Overreacting or saying the wrong thing may fan the flames, but ignoring some kinds of gossip can damage your reputation or even career. Not all gossip is bad. Some workplace talk can help ease stress or frustration over perceived injustices, research shows. . . . Knowing and sharing gossip are ways for employees who lack power to gain informal influence among their peers. American workplaces, especially, are more likely to be built around a top-down, command-and-control organizational and communications structure. When employers do not provide healthy avenues for exchange and feedback, informal conversations may be the only way to share important information. Sometimes there’s a fine line between gossip and useful intelligence gathering. In addition, what some employers might label as gossip may actually be, under certain circumstances, forms of legally protected speech, such as sharing concerns about discrimination or sexual harassment, or engaging in discussions about working conditions. Employment discrimination laws, occupational safety and health laws, labor and collective bargaining laws, and assorted whistle blower provisions may be sources of protection for certain types of worker speech. A graphic accompanying Shellenbarger’s article recommends that when a “rumor is false and threatening your reputation,” confronting the source(s) of the gossip is the appropriate response. On this point, I strongly urge caution and remind us that universal recommended responses may fail to account for critical nuances and can have bad consequences. On balance: Confronting a subordinate is less risky; confronting a peer (or peers) is somewhat riskier; and confronting a supervisor or superior is a very different situation and can be fraught with risk. If gossip is for the purpose of maliciously trashing someone’s reputation and pushing them out of the workplace, then the situation may be part of a bullying or mobbing campaign. This is a far cry from casual or even reckless rumor mongering. We’re now talking about orchestrated, deliberate behaviors. Spreading malicious gossip is among the most frequent bullying tactics used, especially by those who demonstrate psychopathic qualities. Calculatedly and without conscience, they plant the seeds in casual conversations and e-mails: Oh, you know what I heard? Guess what so-and-so told me. You can’t share this with anyone, but…. 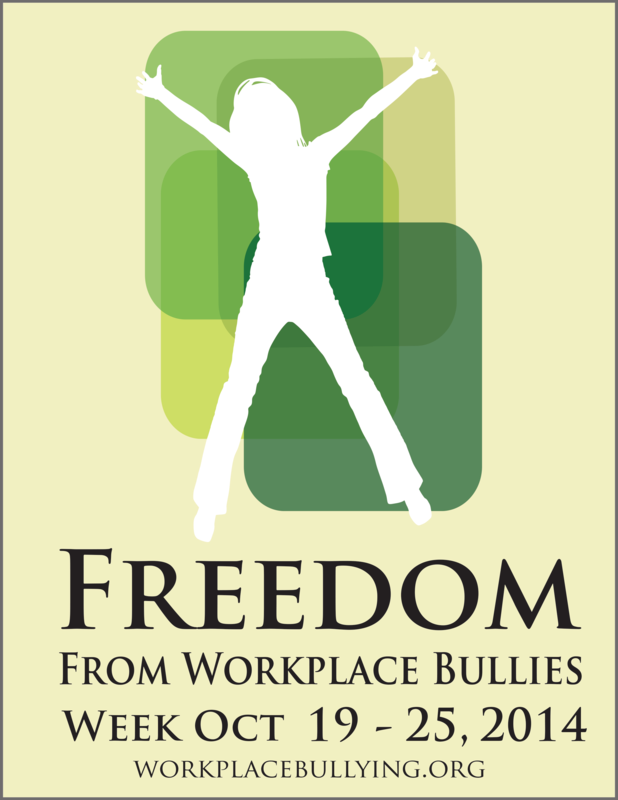 This is Freedom From Workplace Bullies Week (Oct. 19-25), an annual observance championed by the Workplace Bullying Institute. You can go to WBI’s Freedom Week page, which includes a video welcome from Dr. Gary Namie and various resources. 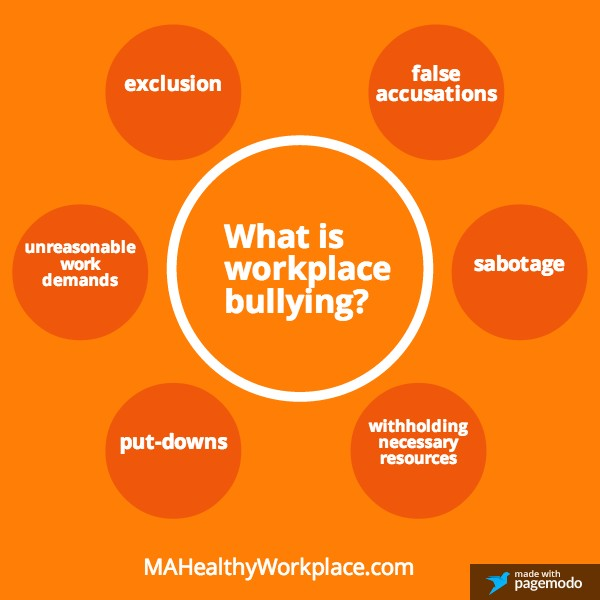 Ellen Pinkos Cobb is the author of Bullying, Violence, Harassment, Discrimination and Stress: Emerging Workplace Health and Safety Issues, an annually updated compilation and guide on relevant laws around the world, as well as host of her newly launched Workplace Bullying Laws website. 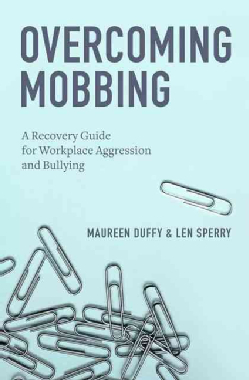 Maureen Duffy and Len Sperry celebrated the publication of their new Oxford University Press book, Overcoming Mobbing: A Recovery Guide for Workplace Aggression and Bullying. Jackie Gilbert, state coordinator of the Tennessee Healthy Workplace Advocates, was part of a working group that consulted with Tennessee legislators toward the enactment of a law directing a state commission to develop a model workplace bullying policy for public employers within the state. Her advocacy work was featured in this Shelbyville Times-Gazette article. Andrew Mitchell continued his important public education work as the host of the Stop Workplace Bullies Now! 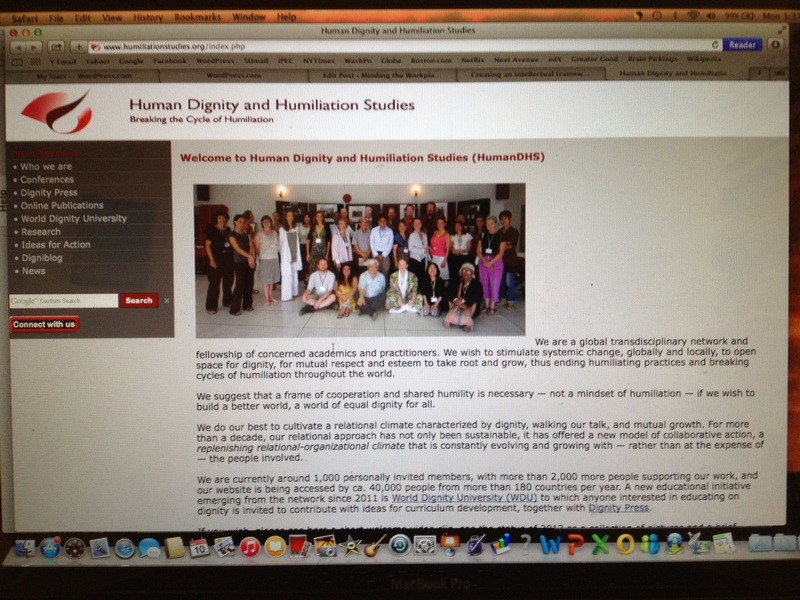 website and his accompanying online aggregator newspaper about workplace bullying. Mike Schlicht and Tom Witt are co-directors of the New York Healthy Workplace Advocates. During the 2013-14 New York legislative session, their group secured 20 state senators and 86 state assembly members as sponsors and co-sponsors of the Healthy Workplace Bill. 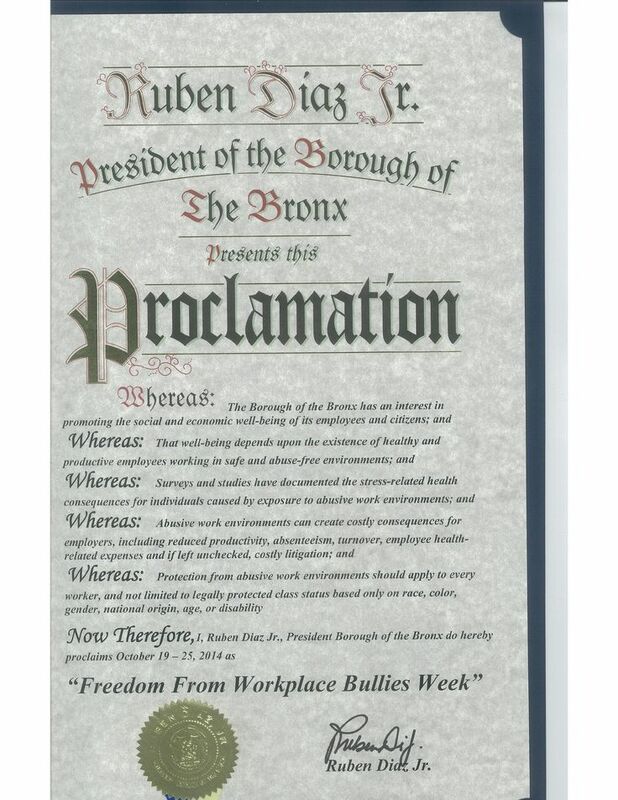 They also secured some 30 Freedom From Workplace Bullies Week Proclamations from New York cities, boroughs, towns, villages, and counties (Pinterest link here). Greg Sorozan, NAGE union president and state co-coordinator of the Massachusetts Healthy Workplace Advocates, was featured in this Boston Globe article about efforts to enact the Healthy Workplace Bill in the Bay State. He also was interviewed at length about his anti-bullying work in a blog post. For some 16 years, Monica Lewinsky has been paying a dear price for youthful mistakes that she happened to make with the President of the United States. Her affair with President Bill Clinton while serving as a White House intern became public in 1998, and it almost toppled Clinton’s Presidency. While Clinton managed to save his Administration and has since become one of the most popular and respected ex-Presidents in memory, Lewinsky has forever been associated with the events of her relative youth. In “Shame and Survival,” a piece that she authored for the June issue of Vanity Fair, Lewinsky, now 41, writes for the first time about what the ensuing years have been like. She describes the cruelties, ridicule, and humiliation, frankly but without excessive self-pity. She recognizes that she was “possibly the first person whose global humiliation was driven by the Internet.” Few others have such a lived understanding of how digital society can preserve our wrong turns and savage a reputation. Lewinsky writes about her experiences with heart, insight, and thoughtful restraint. I moved between London, Los Angeles, New York, and Portland, Oregon, interviewing for a variety of jobs that fell under the umbrella of “creative communication” and “branding,” with an emphasis on charity campaigns. Yet, because of what potential employers so tactfully referred to as my “history,” I was never “quite right” for the position. In some cases, I was right for all the wrong reasons, as in “Of course, your job would require you to attend our events.” And, of course, these would be events at which press would be in attendance. When one’s actions early in life become such a publicly fixed snapshot in history, it’s awfully hard to change that image. I must admit that I, too, had regarded Ms. Lewinsky as frozen in time and reputation. That is, until I read her article a few days ago. I had skipped it earlier because of the way it was being spun by the media. But make no mistake: This is a wise, brave, and intelligent writing. Monica Lewinsky circa 1998 may have been an immature young woman who made some bad choices — not much different than many of us in our 20s. Today, however, her voice is one of character and resilience. With this piece, I believe that she has shed her shame and humiliation. She can now engage the world on her own terms, and it’s our problem if we can’t deal with that. But I hope that her article has had the same effect on others as it had on me. Do-overs may be impossible in this Internet Age, but remakes should be available nonetheless. May the world offer her that opportunity. Update (Oct. 22): I’ve embedded above a speech that Monica Lewinsky gave on October 20, linking her experiences to cyberbullying. She has become an anti-bullying advocate, stressing her concerns about suicidal ideation in the face of bullying behaviors. It’s a very, very good, heartfelt, smart speech, worth 26 minutes of your time. Dear readers, I’ve brought together some past articles that highlight themes of legacy work, personal transitions, and the benefits and challenges of growing older. Many of these pieces discuss books that may be of value to those who want to drill deeper into the subjects. I’ve included snippets from the original posts to give you a sense of each, and you can click on the titles to read the full articles. Especially for those of you who are both reflecting on the past and contemplating changes for the future, I hope they will be of interest! What is your legacy work? In other words, how do you want to make your mark on the world? This potentially life-changing inquiry is a core idea of a book I’ve recommended in recent posts . . . , Chris Guillebeau’s The Art of Non-Conformity: Set Your Own Rules, Live the Life You Want, and Change the World (2010). . . . Guillebeau poses two simple questions: “What do you really want to get out of life?” “What can you offer the world that no one else can?” . . . In addition, I highly recommend Brooks Palmer’s Clutter Busting: Letting Go of What’s Holding You Back (2009) . . .. Palmer nails the psychology of how our material clutter frustrates our ability to live in the present and for the future. What kind of life do you want to live? And as age creeps up on you, how do you want to spend the rest of your life? . . . I recently discovered an intriguing book about adult development, The Ulyssean Adult: Creativity in the Middle & Later Years (1976), by the late John A.B. McLeish, a Canadian education professor. . . . Judging from The Ulyssean Adult, McLeish was not a warm and fuzzy self-help writer. His observations can be sharp-edged and may cause discomfort, as he was not one to pull punches. Conventional wisdom about life’s journey, suggests The Economist magazine, is that our path is “a long slow decline from sunlit uplands towards the valley of death.” If so, then why is the cover of the magazine’s year-end issue headlined “The joy of growing old (or why life begins at 46)” . . . Conventional wisdom, according to research, is wrong. True, we start off our adulthoods pretty happy and become increasingly disenchanted as middle age approaches. However, our outlook then gets better as we age. The Economist cites research studies to back up its proposition, overcoming the presumption that this is more Boomer-inspired babble about how 60 is the new 40. We often hear “body of work” invoked when assessing an individual’s creative, artistic, or athletic endeavors, as in looking at the career of a great musician, writer, or baseball player. . . . But I’ve come to realize that we all produce our own body of work, even if we are not famous artists or athletes. It may include work we are paid for, but it also may capture our contributions as parents, friends, caregivers, volunteers, and members of the community. Ultimately, aren’t we — and the world — better off for having made a positive difference in some way? You know, like starting a company, raising a family, helping those in need, contributing to the community, or inventing or creating or making or fixing something? As I see it, work-life balance should remain a priority for employment relations, but when it comes to individual lives, we need to embrace a much deeper set of questions. After all, does anyone really want to be remembered for having “lived a balanced life”? A lot of people who find their way to this blog are in transitional stages of their work lives, often because of bad experiences at a current or previous job. Some are contemplating a change of employers or even vocations. What’s next? Concrete stuff like finances and living expenses obviously come into play, and the practical challenges of paying the bills may compete with attempts to engage in big picture thinking about one’s life. Nevertheless, we shouldn’t avoid looking inward, in some cases digging deep to turn a setback into an opportunity to consider and create options. For those in this position, William Bridges’s Transitions: Making Sense of Life’s Changes (rev. ed., 2004) may be very useful. Charles D. Hayes, is a retired, largely self-educated writer and practical philosopher whose books and essays on finding meaning in life remain hidden classics. He recently posted to his September University blog a superb essay, “Nostalgia: Why the Past Matters” . . . , in which he makes the case for returning to and understanding our past in constructive ways, rather than with mere soggy sentiment. . . . As one enters middle age, it’s natural to resist any mental associations with aging — and that resistance may extend to reading reflective advice for “older folks.” However, one of the most valuable lessons I’ve learned over the years is to welcome the wisdom of those who have been on this planet a little longer than me. Charles Hayes writes mainly for those we might call “seniors,” but his potentially larger audience includes anyone who wants to pursue a life of meaning and authenticity. Is your organization a “can do” or “can’t do” kind of workplace? In assessing what makes for a good place to work, the contrast between a “can do” and a “can’t do” organizational culture is a major distinguishing factor. The “can’t do” organization, by contrast, makes it hard for even the best of projects to succeed and for new ideas to get off the ground. It sets up layers of bureaucracy, promotes people programmed to say “no,” and plants hedgerows at every stage of approval and implementation. It saps the morale and energy of some of its best people. And then there’s a maddening hybrid variety, the dysfunctional, balkanized organization that readily supports ideas (good or bad, it doesn’t matter) coming from its inner core group, while instinctively blocking initiatives proposed by those it keeps on the outside. I suggest that you’ll find a heavy concentration of “can’t do” and hybrid organizations in the lower ranks of their respective fields or vocations. This may seem self-evident, but obviously it isn’t so to a large cross-section of institutional leaders. Meanwhile, their more inclusive, secure peers at successful organizations are reaping the rewards of a culture that embraces innovation and quality.